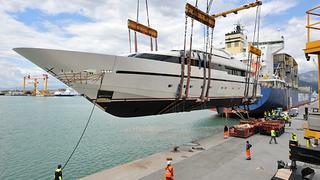 Italian yacht builder Sanlorenzo celebrates the launch of three motor yachts in just one week. Each of the luxury yachts have been commissioned by owners and will be delivered in time for the summer cruising season. The largest to launch is a Sanlorenzo 40 Alloy Liliya. Hull No. 8 in the 40m aluminium superyacht series stands out from her sisters with a pearl-white top coat. Recognisable features of this class include the gull-wing doors off the pilothouse on the upper deck and four extending terraces — two off the main salon and two off of the owner's stateroom. Her Russian owner selected the interior appointments, which include canaletto walnut and anigre wood in a high-gloss finish complemented by onyx and tobacco brown marble. In 2012, Sanlorenzo won the ShowBoats Design Awards Environmental Protection Award for the SL94 based on it exceeding the requirements of RINA's Green Classification. Sanlorenzo's fifth hull in this series, the 28.6m motor yacht B2, starts with this environmentally-friendly basis and builds. She boasts extendable terraces in the salon area and a contemporary style. Also built for a Russian owner, he chose modern pickled-oak joinery designed to match the upholstery. Commissioned by an Italian owner, the new SL82 Pioppi boasts classic Sanlorenzo lines and a huge flybridge that is freed for entertaining by positioning the tender on the lifting aft platform. " SL82 has a long history in Sanlorenzo, we have built more than one hundred units," says Sara Cipolletti of Sanlorenzo. The owner of Pioppi chose flamed canaletto walnut for the joinery and flooring and marble in the bathrooms.